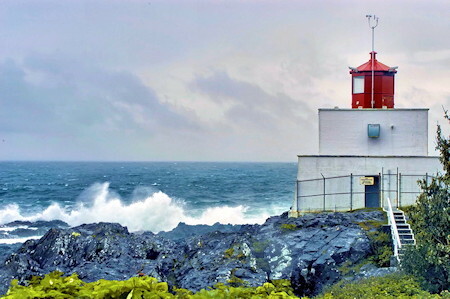 From winter to early spring, storm watching on Vancouver Island, and West Coast of British Columbia attracts visitors from around the world. They come to relax in a luxury waterfront resort or a cozy cottage and experience the awesome power of nature in one of thw world's most magnificent settings. When Pacific storms thunder onto the rugged coastline, and sheets of mist enshrouds the sandy beaches, it is a spectacle to behold. Storm watching on BC's West Coast is a stunning experience. Resort owners and tourism operators are experienced and can advise you on how best to safely enjoy you storm watching vacation. Whether you watch from behind protective glass enjoying a warm beverage, or throw on the rain gear and venture outside, they can advise you on what to bring, and safety measures to observe. Ask them for some tips when you are making your booking inquiries, and come prepared to discover the power of nature. Resorts, lodges, inns and Bed & Breakfasts on Vancouver Island, The Gulf Islands, The Queen Charlotte Islands or any of the many other islands or bays along West Coast British Columbia, specialize in Winter Storm Watching Vacations, and they will do their best to make your BC storm watching vacation a comfortable and unforgettable event!